If you’re a keen royal watcher, you have probably noticed that Prince William headed straight back to work after his third child was born, something he hasn’t done with previous children. William and Kate had a mini break with family over Easter, before little Louis arrived and it’s been business as usual since then. When Louis was born on 23 April, Prince William attended the birth and then appeared in front of the world’s press, first with Princess Charlotte and Prince George, as he took them to see their baby brother, then again when he and Kate left the hospital to take their baby home. Two days after the little Prince’s birth, William was seen at official functions to mark Anzac Day. Despite being captured in that familiar and exhausted haze of newborn life (falling asleep! ), he’s continued to push on with engagements ever since. William was seen attending the opening of a sporting centre three days after Louis’ birth and at the opening of London Bridge Station yesterday. It’s thought that because Prince Charles has been touring the Commonwealth, and Prince Harry has been in wedding planning mode, William’s taking on more work to support his brother and fill in any gaps. Previously Prince William has taken at least two weeks off to retreat into the baby bubble, but it’s been nose to the grindstone since Kate went into labour. Perhaps we’re also seeing the royal version of a quite typical “third child response” play out, where experienced parents simply kick on with life and don’t have the ability or inclination to take time much off. The power of sport can change lives. Today The Duke, Prince Harry, and Coach Core apprentice Khadra opened the new @greenhousesports Centre, which provides sports coaching designed to help empower and inspire young people growing up in disadvantage. It’s a different story for third-time new mum, Duchess Kate, of course. She’s on maternity leave until Autumn, caring for Prince Louis, Princess Charlotte and Prince George with the assistance of the family’s nanny, and possibly with some help from her mum, Carole Middleton, too. 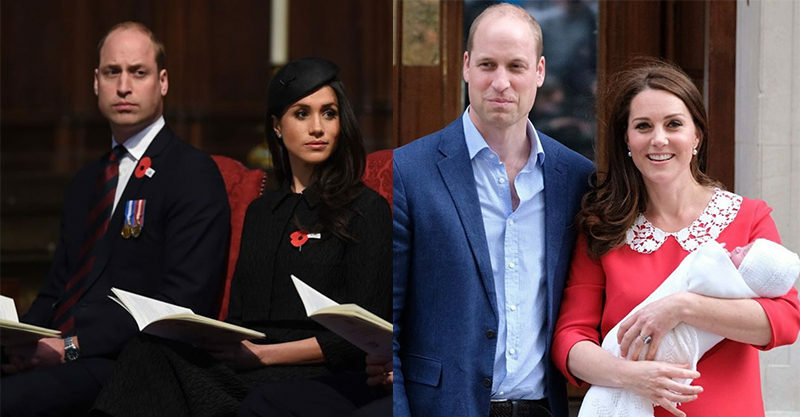 The family will be seen together next weekend at Harry and Meghan’s wedding, with the exception of Prince Louis. At this stage, the palace are saying that the newborn will be kept out of sight on the big day, well away from noisy crowds and cooing wedding guests. The entire family of five is expected to be seen together for the first time at the June parade, Trooping The Colour.